A stunning debut set in a world where reading is unheard-of, perfect for fans of Inkheart and Shadow and Bone Sefia knows what it means to survive. After her father is brutally murdered, she flees into the wilderness with her aunt Nin, who teaches her to hunt, track, and steal. But when Nin is kidnapped, leaving Sefia completely alone, none of her survival skills can help her discover where Nin's been taken, or if she's even alive. The only clue to both her aunt's disappearance and her father's murder is the odd rectangular object her father left behind, an object she comes to realize is a book--a marvelous item unheard of in her otherwise illiterate society. With the help of this book, and the aid of a mysterious stranger with dark secrets of his own, Sefia sets out to rescue her aunt and find out what really happened the day her father was killed--and punish the people responsible. 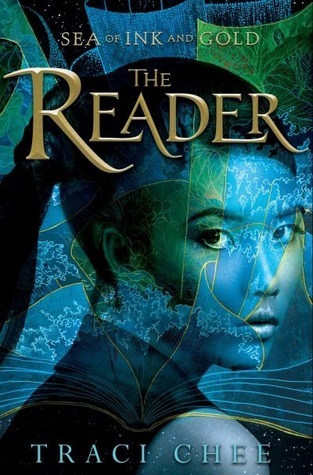 The Reader by Traci Chee is the first of the Sea of Ink and Gold series. It has such a cool premise – where reading is powerful and it is a thing that not everyone can do. The jacket compares the story to Inkheart and Shadow And Bone. Those two books are novels that I really loved reading. Thus, my expectations for Chee’s book were kind of high. Unfortunately, I did not love The Reader as much as I had anticipated. The Reader is about a girl named Sefia. Sefia’s parents are both dead. Her mother died when she was quite young. Her father was brutally murdered. The book opens with her aunt who has been kidnapped by a mysterious group of people. Sefia is left with a mysterious object in her backpack that she protects with her life. She has also been left with whole lot of questions. She picks up a silent boy who has been forced into fighting along the way to find and rescue her aunt. Meanwhile, there is a parallel storyline to Sefia’s where a boy named Lon narrates about how he is plucked from street performances to become a scholar and join a secret society. The way the two storylines come together is completely unexpected. Sefia is very tough. She has wonderful survival skills. She possesses a will to defy the odds. I found myself really liking her character, even when she put up a hard exterior toward the silent boy. Sefia has had quite a hard life. However, she never ever gives up. She also is so loyal to her family that she will face danger over and over again to save them. She has a lot of great personal qualities. Her pain, at different points, is very real too. As for the world building within The Reader, I felt like it could have been more thorough. Essentially no one in Sefia’s world reads or even has the ability to read. Sefia has what is the only book in her possession. I do not understand how the world got to that point but I would really like to. I think that the author did a decent job setting the scene – it is not hard to picture the journey of Sefia and the boy. Finally, I felt like the writing style in The Reader left a little something to be desired. It took me forever to get through this book. I never felt truly engaged in this story. Additionally, the pacing is very slow. Sefia is a great character, to be sure, but I never fully invested in her. My attention wandered constantly while reading this book. Skip this book if you are looking for excitement. Read this book if you want a very detailed story with an intricate plot line. This sounds intriguing enough to me to give it a try. Especially if I can get it at the library or cheap for my Nook. A world without written words is almost unfathomable to me. I really love the cover and the premise, so it’s too bad that it didn’t live up to your expectations! I don’t mind intricate books but I think the lack of detailed world building would bother me. I’d want to know how the world got that way too! Thanks for the review, I’ll probably check this out of the library sometime once it publishes.